Gym in Rockaway New Jersey employs two disabled veterans to coach fitness classes. Together, they establish a charity to help wounded veterans with fitness and peer mentoring. Few people understand team work better than a veteran! Blue Titan Fitness & Self Defense is proud to announce that wounded veterans Logan Farr and Michael Gallardo have been hired to serve the Morris County community by bringing health and fitness tools to adults of all ages. Hired this summer, Logan and Michael both suffered catastrophic injuries resulting in amputation while serving in their respective branches of the United States Military. Despite their injuries, both these men embody the “never quit, no limitations” mindset that Blue Titan hopes to share with the communities in Morris County NJ. As a former police officer himself, Blue Titan’s owner Eric Basek is no stranger to public service. Hiring these two veterans and helping support their families required little deliberation. “Military service members live in a world where failure to work as a team and achieve an objective could result in death. This work ethic, never quit attitude and team spirit are rare commodities. I am, truly, lucky to have them.”, Eric said. Taking this one step further, the three of them have put together a team of police officers and veterans to sit on the board of a brand new charity called the Stay Safe Foundation. It is their hope that they can help empower, educate and mentor both police officers and veterans injured or struggling with depression as a result of their service to this great Nation. Logan is a veteran of the US Air Force who was hit by a train three days after returning from his deployment to the middle east. As a result, his feet were both amputated and his military career was ended. His recovery began in the hospital bed, where he requested a special pull up bar to work out while recovering. 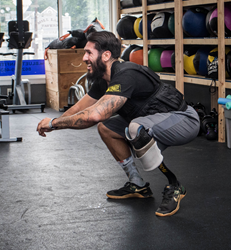 He is now a sponsored adaptive athlete and a coach who educates fitness trainers on best practices for working with other adaptive athletes. Michael is a veteran of the US Army. During a mission in Iraq, his Humvee was hit by a refrigerator sized IED. While attempting to rescue the driver trapped in the vehicle, he suffered an injury to his leg that resulted in amputation just below the knee. 9 months after amputation, and despite being told he might never walk again, he completed the world’s hardest Triathlon in Kona Hawaii. Also employed by MLB TV, he turned his internship into a career and is the first disabled combat veteran to win an Emmy for graphic design. Blue Titan Fitness & Self-Defense was founded in November of 2011 by Eric Basek, a former police officer in Washington DC. Blue Titan is an official CrossFit and Krav Maga Worldwide affiliate teaching fitness and self-defense to kids and adults of all sizes, backgrounds and ability levels.